My trip back to Michigan has sadly come to a close. After spending four very active days in Detroit, I slowed down the last few days to spend time with friends and family. However, I did do something uniquely Michigan during my last days in the Great Lakes State. Thursday was a cold and rainy day in Detroit after a beautiful week of weather. My wife and I were going to take the girls to a cider mill to spend some time outdoors, but we decided to leave them at their grandma and grandpa's house where they could stay warm, dry and full of the junk food that we do not allow at home. We did some shopping in the suburbs where I was able to get some rain boats and a Detroit Tigers t-shirt with “Kaline” and the number 6 on the back. 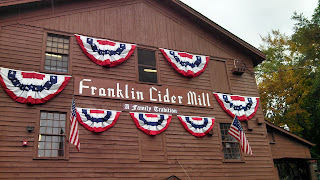 We then visited the Franklin Cider Mill. The Franklin Cider Mill was built in 1837, the same year that Michigan became a state. It is located in Bloomfield Hills, on 14 Mile Road about one mile west of Telegraph Road. 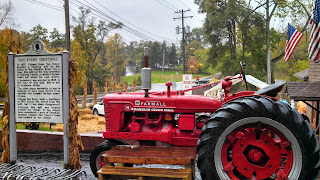 I had been to the Franklin Cider when I was young, but I could only remember that it was the brown building, while Yates Cider Mill in Rochester was the red building. I went to Yates last year and was impressed by the petting zoo and the walking trail, but I knew Franklin did not have these amusements. Instead, Franklin just makes apple cider, donuts, baked goods, jams and honey. 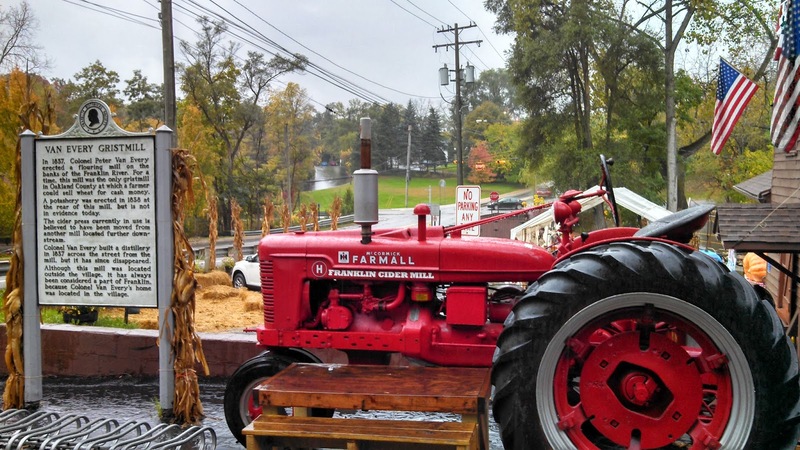 We did not spend much time walking around the cider mill because of the weather, but we did see the giant mill wheel and appreciated the view of the stream that cuts through the grounds between the parking lot and the mill. Once we entered the building, I was overcome will the smell of the donuts. We purchased cider, some apple pie bread and a half dozen donuts, but the donuts were the highlight by far (and that’s saying a lot since the cider is very good too). The donuts are purely delicious…especially when you eat them fresh and warm. Just amazing. We were going to hang out at my parent’s house in the suburbs, but I felt Detroit calling me back. 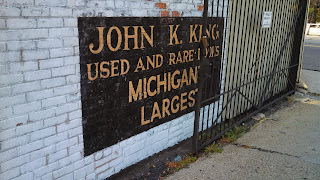 I had read about John K. King bookstore in Detroit, Michigan's largest rare and used bookstore, and needed to visit. I love the smell of old books and the feel of their old and worn pages on my fingertips as I flip through their pages. 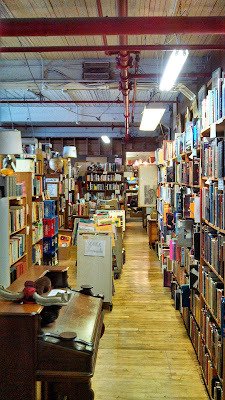 Even if I do not buy anything, I often will wander into a used bookstore when I am in a new town. Just being around all of that recorded knowledge gives me a sense of pride in humanity's intellectual accomplishments. 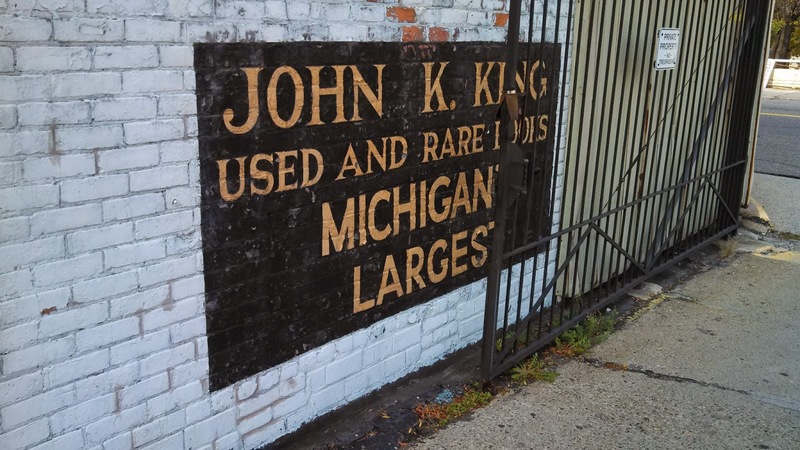 John K. King opened his first bookstore in Dearborn in 1971; soon moved to Detroit; and bought the current four-story building at 901 West Lafayette in 1983. Even though the store has only been at its current location for 30 years, it feels like it’s been there for 100. 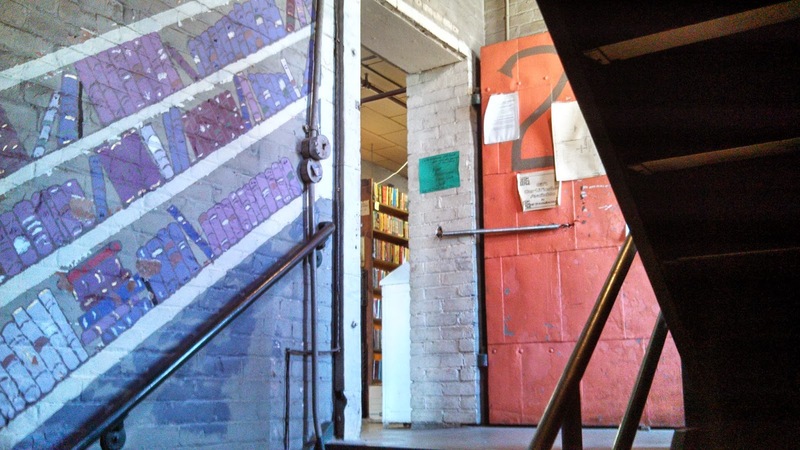 The building looks and feels old with its dusty, metal-framed windows, brick walls and creaky wood floors, but it also feels like a used bookstore should. The older hardcover books seem to have settled into place on the shelves…almost is if they came with the building. Much like visiting a great museum, like the DIA, I could have spent a whole day wandering through the aisles of fiction, poetry, history, religion and art books. On this day, I focused on the Michigan and Detroit history sections. The store has a wonderful collection of Michigan-related civil war books, city directories and state and county histories. I rarely enter a used bookstore looking for a specific book. Instead, I wander around the store until a book finds me. 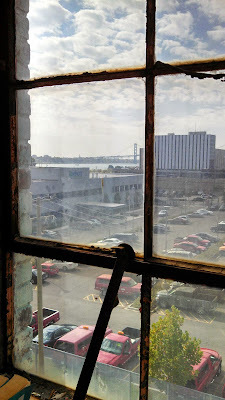 As I perused the stacks, one title grabbed my attention, "Detroit Is My Own Hometown," a book about Detroit in the 1940s when Detroit was still in the midst of its golden age. 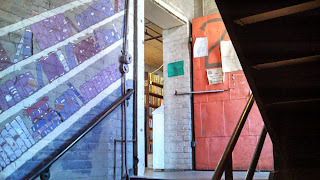 I hope to visit John King Books again when I have more time. 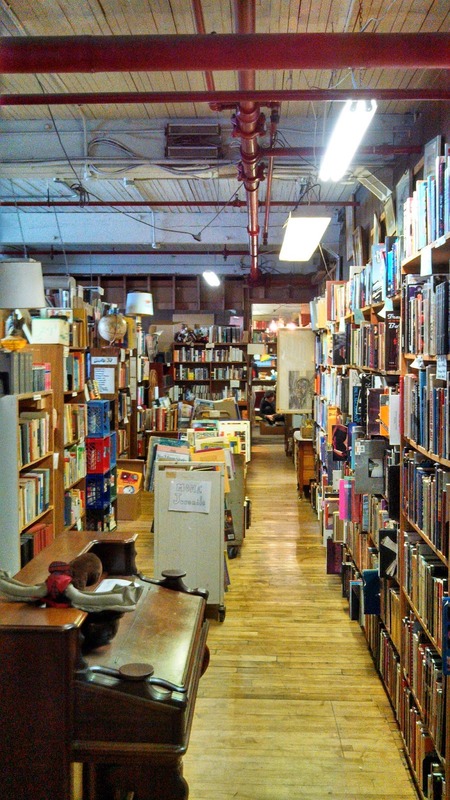 If you love books and live in the Detroit area or happen to visit Detroit, there is no excuse for not visiting this store at least once. After visiting John King Books, we drove to the Woodbridge neighborhood of Detroit near Wayne State University, and had a delicious lunch at the Woodbridge Pub. Woodbridge is neighborhood with many Victorian homes. 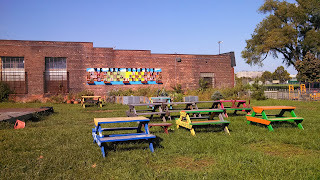 A community garden with colorful picnic tables sits across from the pub, and the nearby streets are full of well maintained homes. On the side of a house next to Woodbridge Pub are the words ARTINWOODBRIDGE.COM. Art in Woodbridge is an effort to bring public art to the neighborhood. As a result of their efforts, several murals and sculptures line Woodbridge's streets. For photos of this art, please visit their website above. The neighborhood feels vibrant. 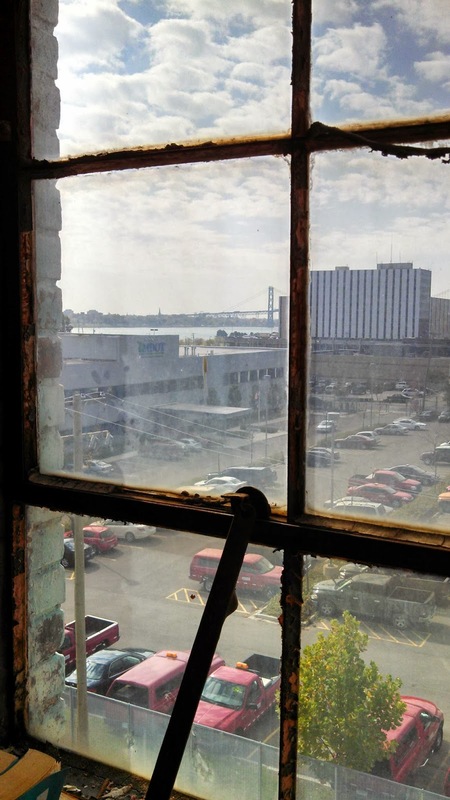 This is not the stereotypical depressed Detroit. On this sunny day, I could feel the hope and sense of community reflecting off the art and the windows of the the neighborhood's homes. Detroit is a beautiful place. Yes, there are neighborhoods that are drowning in blight that I did not visit, but there are ongoing efforts to combat that blight. Ignoring the blight on my blog will not make it go away, but why write about something that national media seems to write about every day, especially when there are so many interesting things to do in this city? In only six days, I visited an amazing zoo, an international riverfront, a world class museum, wonderful restaurants, a baseball diamond where legends once roamed and an outdoor market that pulses like the heart of the city. Those six days were not enough to do everything I wanted to. Detroit is alive. Detroit is beautiful. Detroit will never die. Detroit is my own hometown.